The Shepherd Centre has recently finished its cutting-edge program, Confident Kids in the Classroom. The group program teaches social communication skills to young children with hearing loss (aged 3 to 5 years old) to help boost their confidence in social settings. The program was established as a result of The Shepherd Centre’s research into Theory of Mind (ToM). Theory of Mind is the ability to recognise that people have different mental states (knowledge, feelings, desires and beliefs) from our own. As our mental states are not always expressed clearly or directly, children with hearing loss can have trouble recognising them; the ability to detect a shift in tone or grasp implied meaning through figurative language can be challenging, particularly in complex listening environments. This, in turn, revealed that the acquisition of language, speech and listening skills does not always translate to age-appropriate social skills, which can affect confidence when interpreting or responding to social situations. 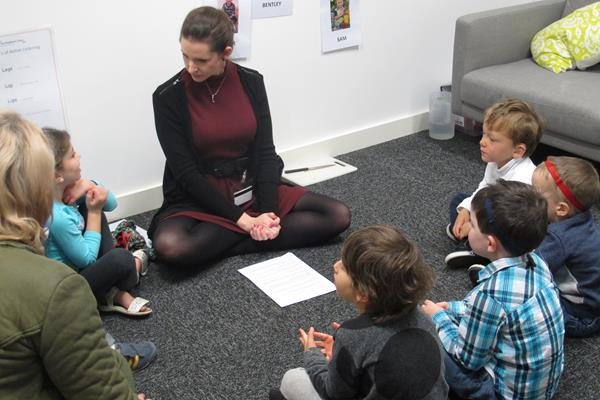 Our Confident Kids in the Classroom Program aimed to turn this around and during Term 2 our Listening and Spoken Language Specialists (LSLS), Jess and Tess, delivered ‘split-sessions’ to both children and parents. Over eight weeks they led children through a series of play-based activities that strongly engaged key social skills such as, listening to understand, questioning to clarify and participating to solve problems. Parents were also provided with plans they could implement at home, and during day-to-day life, to support and improve their child’s social skills and help develop their confidence. The feedback from Confident Kids in the Classroom has been wonderful; parents are amazed at their children’s increased confidence in social settings and the positive impact it has had on their transition to big school; they are quick to interpret social situations, identify emotions and independently solve communication problems. To find out more about the program, please visit our Confident Kids page or contact [email protected].